As interior design and interior decorating professionals one of the most difficult tasks we have is to create drawings that clearly convey our interior design ideas quickly and affordably but that also impress our clients. Clients have come to expect sophisticated and costly computer drawings. Contractors want digital output that’s easy to transfer. Yet the economy has pushed design offices, projects and commissions to be smaller. To survive in this competitive market, we need to make smart and strategic decisions every day that keep our costs down but allow us to deliver quality design work that stands out from the crowd. One of the biggest and most costly decisions is which interior design software to use. 2D & 3D CAD software continues to revolutionize the industry, but it’s costly, time-consuming and requires technical training or trained staff. As savvy business professionals, does it make sense to invest in over-powered and complicated CAD software when we really just need to create a floor plan or design a room? With RoomSketcher online home design software, you can create interior designs – quickly, easily and affordably. Since 2007, RoomSketcher Home Designer has been empowering hundreds of thousands of homeowners, builders, and interior design and interior decorating professionals to create floor plans and home designs. RoomSketcher Home Designer has an intuitive drag-and-drop interface that makes drawing floor plans and furniture plans easy. Simply click and drag to draw your walls – select windows, doors, stairs and furniture and drag-and-drop them into place. The handy measurement and guideline tools give you accurate results. Unlike conventional CAD software, RoomSketcher requires no downloads or technical training so you can start designing straight away. The RoomSketcher product library contains more than 5,000 brand-name and generic fixtures, finishes and furniture items. Change the finish and color on the walls, floors and ceilings. Select and arrange lighting, cabinets, bath fixtures and furniture to create your designs- designing a room has never been so easy and the possibilities are unlimited! RoomSketcher is more than just a 2D floor plan maker- it’s 3D home design software. Integral state-of-the-art rendering and 3D visualization technology allows you to visualize home designs in 3D. A virtual 3D model of your floor plan is generated while you draw and an easy-to-use camera tool lets you take 3D Snapshots of your designs instantly. Use the 3D snapshot tool to view any part of your design as if you were standing in the room. Create and save multiple snapshots to compare different design options and find the best solutions quickly and easily. With Live 3D you and your clients can navigate through a home design as if you are touring the actual home interiors– walking from room-to-room, turning around, stepping closer or farther away. Use an avatar to navigate around the room design, or fly above the floor plan to get a complete overview. Impress your clients with the next level of home design visualization and give them the interactivity they love! Choose from a variety of standard floor plan symbols. Add room numbers and labels, furniture, fixtures and finish keys, text boxes, notes, even a north/south compass for project orientation. Customize your floor plan letterhead to include your company name and logo, project information, drawing copyright, use and disclaimer text. RoomSketcher Floor Plans can be printed or saved in a variety of digital formats for web and PDF formats for print, in either metric or imperial (feet:inch) scales. Classic 2D floor plans have always been the standard to show the layout of a project, but many clients struggle with visualizing space and find floor plans hard to read. 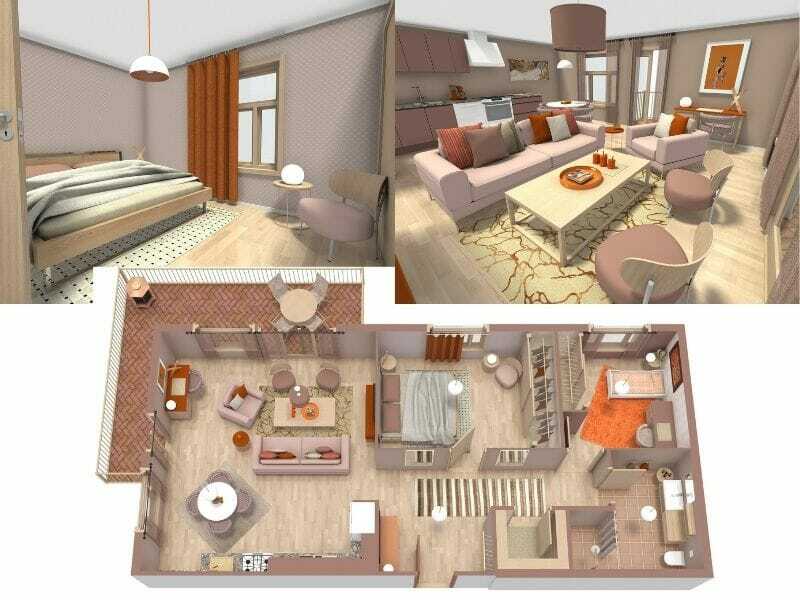 RoomSketcher 3D Floor Plans take floor plan and design visualization a great leap forward, especially when they are fully furnished with your interior design ideas. Once you have a RoomSketcher project you can create 3D Floor Plans instantly with the click of a button. Review your designs in 3D and provide your clients with a clear high-quality 3D floor plan of your interior design so they can see its value and potential effortlessly. With RoomSketcher you can take snapshots of your favorite interior design and interior decorating ideas and elevate them with stunning state-of-the-art 3D Photos to “Wow” your clients. Download your 3D Photos to add to mood boards, share with clients, or print out for meetings and presentations. Whether you need to just design a room or remodel a whole home – RoomSketcher 3D Photos allow you to show your clients a true visualization of their design. With the Share Live 3D Floor Plans feature you can share and collaborate on a design project with your clients and contractors. Allow them access to the project in Home Designer to review a potential room or home design from their computer, before any remodeling has started! They receive a copy of the project so they are free to play around, add updates or just to save it for easy reference. The Share Live 3D Floor Plans feature makes sharing and collaborating on home design projects and interior design ideas easy! If you are short on time or need to get your project going right away, use the RoomSketcher Floor Plan Services! Simply scan an existing blueprint or sketch and order a finished professional 2D & 3D floor plan from one of the RoomSketcher expert illustrators. Your order will be ready next Business Day! RoomSketcher Floor Plans come with instant correction – no waiting on revisions. Simply open your floor plan in Home Designer and start customizing and designing it to suit your project. Getting your preliminary drawings started has never been so easy or so fast! Today, interior designers and decorators are always on the go and our work needs to go with us. All RoomSketcher projects are stored in the cloud and available online. With a laptop and a Wi-Fi connection you can access and work on your projects anywhere you need to. With the RoomSketcher Mobile App you, or your clients, can view projects instantly on a mobile phone or tablet. Have your projects handy wherever you need them- in meetings, shopping, on-site, or anywhere in-between. RoomSketcher online home design software makes it easy to do your work on the go! RoomSketcher comes as different types of subscriptions, depending on your needs and preferences. However, you can access many of our features, including RoomSketcher Home Designer, without spending a cent. Signing up requires no credit card. We’ll help you get the most out of your RoomSketcher projects. When you want to generate any of our high quality outputs or access premium features, you either upgrade to the Pro subscription, or you can purchase an upgrade for one single project. It’s that easy! Start saving time, money and resources by creating a free account today!